This is a mobile site. Click here to go to our full website. 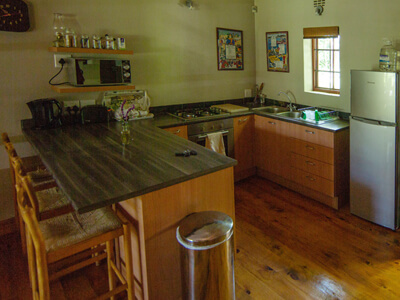 Located high up in the stunning beautiful Amatola Mountains, the hamlet of Hogsback is reminiscent of a bygone era, where life is slow and tranquil and one can enjoy the beauty of nature at its best. Feed your soul at Laragh-on-Hogsback where nature is timeless and infinite. Relax on your covered patio; listen to the sounds of the forest around you – birdsongs in the morning, the chirping of insects in the evening. Enjoy the stupendous full moon rising over the three Hogs or get-up early and watch the glorious sunrises. Gaze at Tor Doone in anticipation of your walks to the several waterfalls set amongst one of the few sub-tropical mountain forests left in South Africa. 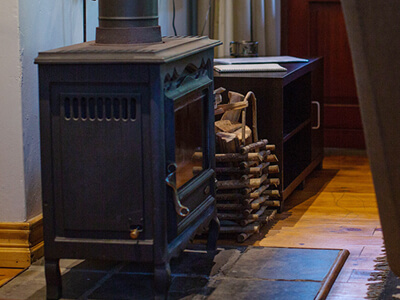 Breathe in the crisp clear mountain air, revel in the winter cold and snow (weather permitting) and then curl up in front of a roaring fireplace, and enjoy the warmth and comfort of your cottage. Laragh-on-Hogsback, (Laragh pronounced LAR a) named after our ancestral farm in Ireland, is a Gaelic word meaning “this or the place”. The Celtic knot in the logo signifies the joining of man and nature especially with the tree as the fountain of life. The essence of the ambience we have recreated here. 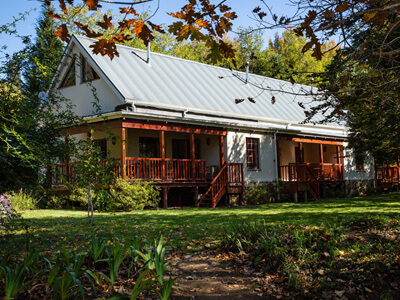 Newly built (2013/4) Laragh-on-Hogsback is set in a country garden filled with both indigenous and exotic trees. Enjoy the sight, sounds and smells of our many yellowwoods, beeches, oaks, liquid ambers, spanish chestnuts, magnolias and silver birches. We are close enough (1 km) to the “village CBD” with its pubs and restaurants but far enough away to enjoy the peace of nature. 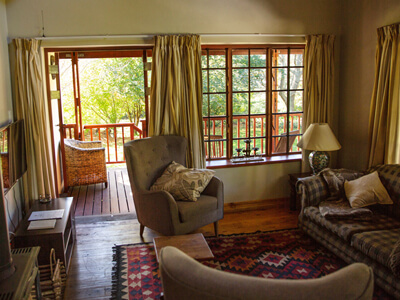 Our upmarket luxury cottages are fully kitted with all the mod cons but still retain the rustic charm and warmth of natural wood flooring and high-pitched ceilings. 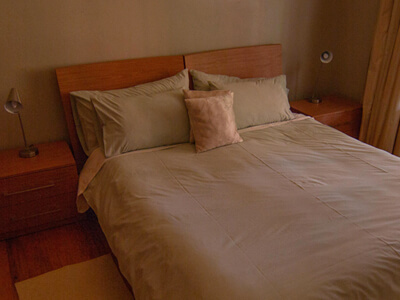 Our guest cottages are located in a private garden of mature indigenous and exotic trees. 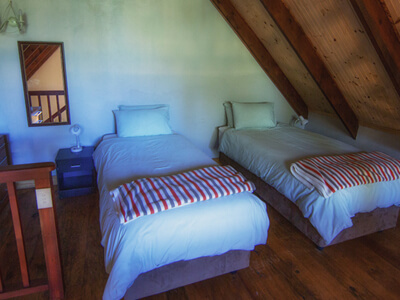 These self-catering units consist of three cottages (Yellowwood, Copper Beech and Magnolia) under a single roof. Each cottage is self-contained with separate entrances and entertainment decks designed to ensure your privacy and comfort, and sleeps a maximum of 4 guests in 2 bedrooms. We regret – no animals or pets. 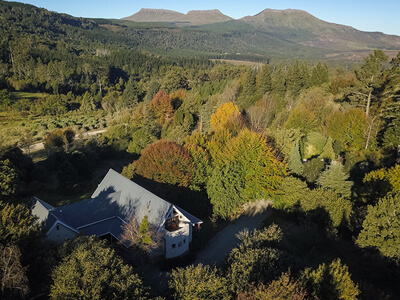 Hogsback is a nature lover's paradise - a mountain hamlet surrounded by the Elandsberg, Amathole Mountains, the Hogs - 3 mountains with ridges that resemble the 'bristles' of a Hog - and Gaika's Kop. It is in the heart of Frontier Country where the 8th Frontier war was started. Walking trails through the forests include the Big Tree - a 300-year-old Yellow Wood. The Arboretum - a living museum of the different trees found in Hogsback - is en route to the 39-steps waterfall, one of the many spectacular waterfalls to visit. The Amathole trail - a grueling 6-day hike - ends in Hogsback near the Swallow Tail waterfall. Abseiling is an option at the popular Madonna & Child waterfall. Kettle Spout waterfall offers panoramic views across the Tyume Valley. There are over 200 species of birds including the endangered Cape Parrot. Look out for the rare Samango monkey. For the more active, there are mountain bikes for hire, fly-fishing on the nearby farms, and horse riding. 4 distinct seasons offer amazing photographic opportunities. Spring is beautiful - garden enthusiasts are welcome to visit show gardens on an organized garden tour during this season. Summer is delightfully warm with waterfalls in full spate. The autumnal trees are a splash of splendid colours as the trees shed their leaves. Winter offers great anticipation for snow, a source of great delight for one and all. Enjoy spectacular sunrises over the Hogs! Experience the breathtaking moonlit evenings at full moon. DO NOT use the GPS – it will try and send you up the dreaded Mitchell's Pass via Seymour – this is major 4 wheel drive only!